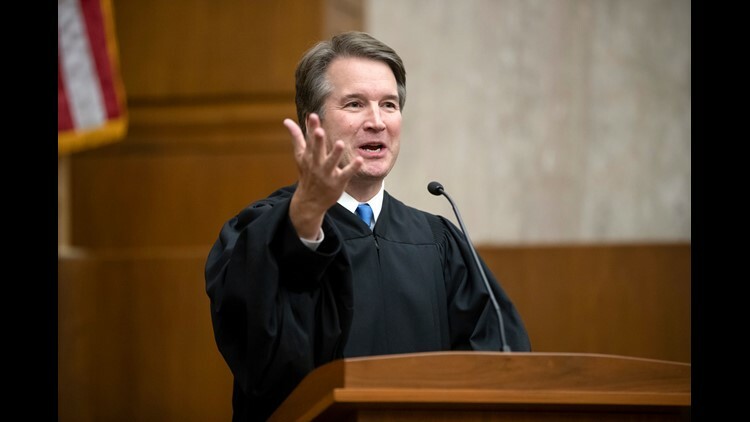 President Donald Trump's Supreme Court nominee, Judge Brett Kavanaugh, speaks as he officiates at the swearing-in of Judge Britt Grant to take a seat on the U.S. Court of Appeals for the 11th Circuit on Tuesday, Aug. 7. WASHINGTON – Senate Republicans decided Friday to push ahead with a confirmation hearing for Supreme Court nominee Brett Kavanaugh despite a dispute with Democrats over documents from his years working at the White House. Judiciary Committee chairman Chuck Grassley announced that the hearing would begin Sept. 4, less than two months after President Donald Trump nominated Kavanaugh July 9 to replace retired justice Anthony Kennedy. The hearing is expected to run four days. The schedule is typical for a high court nominee, but because Kavanaugh, 53, spent five years working in the White House during George W. Bush's administration, Republicans and Democrats continue to feud over what could be more than 1 million pages of documents. Most of those are from his three years as White House staff secretary. "My team has already reviewed every page of the over 4,800 pages of judicial opinions Judge Kavanaugh wrote, over 6,400 pages of opinions he joined, more than 125,000 pages of records produced from his White House legal service, and over 17,000 pages in response to the most comprehensive questionnaire ever submitted to a nominee," Grassley said. "At this current pace, we have plenty of time to review the rest of emails and other records that we will receive from President Bush and the National Archives," he said. "It’s time for the American people to hear directly from Judge Kavanaugh." Democratic leaders objected to the schedule, since it indicates Republicans have no intention of releasing documents from 2003 to 2006 in time for the hearing. The GOP has argued it would take months to go through, extending the confirmation process beyond both the Oct. 1 start of the court's 2018 term and the Nov. 6 election, when control of the Senate is in play. Republican efforts to make this the least transparent, most secretive Supreme Court nomination in history continue. They seem to be more frightened of this nominee’s record and history than any we’ve ever considered. Kavanaugh has met with most Senate Republicans over the past month but only one Democrat, Sen. Joe Manchin of West Virginia. More sessions with Democrats are expected to be held in the coming weeks. White House spokesman Raj Shah said the Senate has reviewed more documents than for any other high court nominee in history. The process, he said, has been "open, transparent and fair."